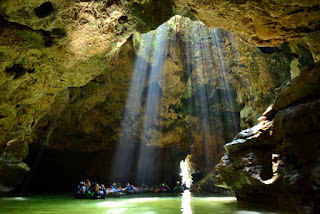 Filled holiday by visiting unique places certainly very pleasant, refreshing and increase knowledge, Goa Pindul Jogja could be one option. Attractions Goa Pindul located in the hamlet Gelaran, Bejiharjo Village, Wonosari, Gunung Kidul, Yogyakarta which is booming at the moment. Pindul Cave is an underground river like in PUERTO PRINCESA, but the distance is not too long. Wirawisata is one of the official providers who manage these attractions. With all the appeal of natural beauty make anyone curious about visiting this place. An underground cave which water flowed into its own unique charm of these places. 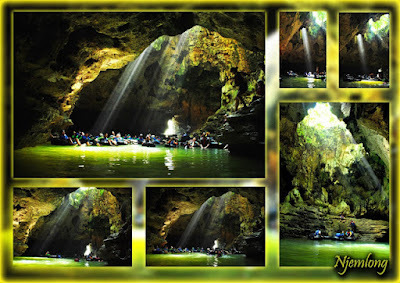 Pindul has a length of approximately 350 m, a width of up to 5 m, distance to the water surface of the roof of the cave 4 m, and a depth of water of about 5-12 m. Goa Pindul has 3 zones. light zone, the zone lit and dark zones. It takes about 45 minutes to 1 hour. You also do not have to worry as you want along Cave, the place is very safe for all ages, from children up to age up though, because the water that flows Pindul Cave comes from the springs are flowing slowly though the rainy season. 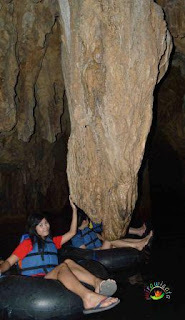 And the traverse in Cave you will see some of the stalactite and stalagmite that adorn Pindul Cave, you will also see some light rock crystal lamp while directing guide in the stone. There is also a stone called Mighty rocks and stones Pearls therein, and has its own myths, of course, your guide will explain. Once you arrive at the location we are Wirawisata, you must first break in the hall-pavilion built in Wirawisata. Then you buy a ticket at the registration window that we have provided. Do not forget to wear wet clothes ready. It is important to remember, you also do not need to bring valuables into the object, because it was feared water.And wet or fall would be very difficult to be taken if it has been dropped due to varying water depths. Please leave your stuff in place care goods that we have provided. - Travelers are required / must wear a life jacket. --- Small size, for children under 12 years old. --- Size medium, the standard size for an adult is able to withstand the weight of up to 100kg wet. --- Jumbo Size, Big Size, able to withstand the weight of more than 120 kg. Please choose the size according to your weight. We also provide waterproof rubber boots if you want to wear it, but this is not mandatory, or you may be wearing footwear that you bring your own. 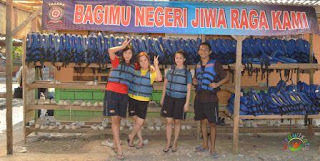 Wearing a life jacket that has been provided. Before leaving please check your goods back, in the pocket of your pants or shirt. Then you walk a distance of approximately 100m towards Pindul and bring the tire tubing, or you can ask the guide to bring the tire tubing. -Before Up in locations normally you are required to stop for a moment to make sure your goods are not carried away, given the object to be visited in direct contact with water. The guide will also introduce themselves. And we will continue the journey to Goa Pindul. Next is down Pindul Cave. Sitting above the tire tubing you will be given a full explanation of this object of your guide. Please ask for it less clear guide for you in Pindul.Your Guide will be ready to answer. In the first zone is the zone light you will see some stalactites (rock grows and enlarges from the top down) and also stone pillars (meeting of stone stalactite and stalagmite rock (rock which grew towering from the bottom up). You will also see the well upside down and bird nest and much more in this first zone. Zone 2 is lit zone, you will find hanging stalactites adorn the cave. This is the most favored zone by a man and a woman. 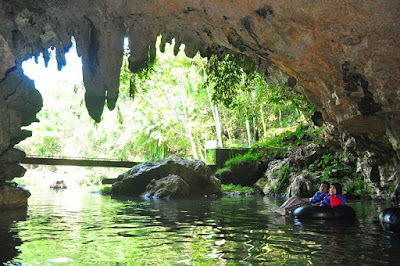 In addition to a great place to take pictures between stalactites and rock crystal seen first as a guide shown below. In this zone there are also stone mighty stalagmites that have a myth or a suggestion, if adam or men who survived or even holding the stone can make men stronger and brave. Because behind the stalagmite stone hermitage. So supposedly is only for those who believe. 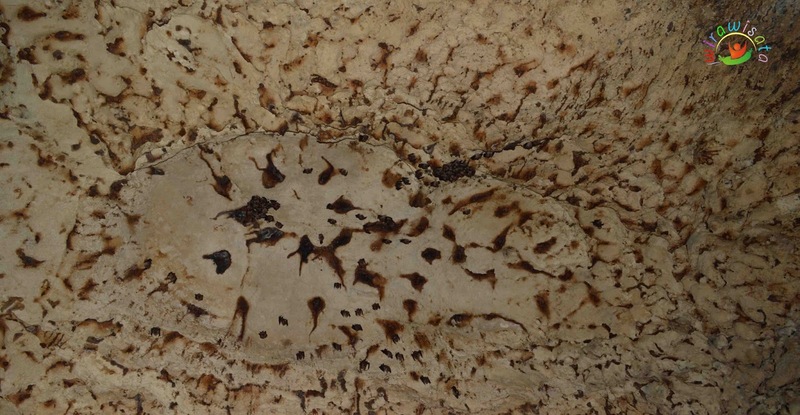 In addition to the myth of Adam or man, here in this dimly zone there is also a myth for women or adult women who want a younger or more beautiful, there are stalactites stone pearls that are still active. The stalactites are small, but it is estimated hundreds of years old. This stone is believed to increase beauty and ageless if lucky exposed to droplets of water that falls from the rock. Once again it was all just a myth, you may believe it or not. The third zone is the eternal dark zone, called the dark zone in the zone or lasting because this room was never exposed to direct sunlight or light reflected from the walls around it. This place lit only by flashlights guide only. A guide will turn off the flashlight if you please, for a moment of silence and prayer in this classroom. The rooms were still considered sacred and is believed to pray about the positive things in this place, a lot is granted by God Almighty. If you do not want to turn off his flashlight guides, you can also take pictures here. 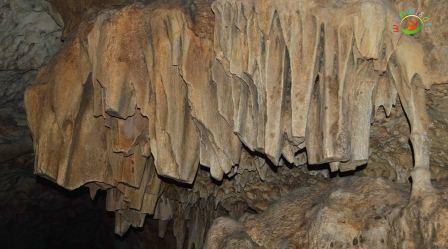 There is also the second largest stalactite stones that decorate this dark zone. You may pose and hold the section of dry stone. There is the second largest, of course there are the greatest first. Below is a picture of the first biggest stalactites in Goa Pindul. People call it by name Soko Guru that according to some sources, meaning Poles Buffer Cave or the hills above. Soko Guru stone size is approximately five ranges hands of adults. Although the so-called pillar Cave / hill, after further investigation it turns out the biggest stalactites in Goa Pindul not touched until the bottom of the river. And still hanging about 4 meters below the water surface. Given into the area around 11 meters. 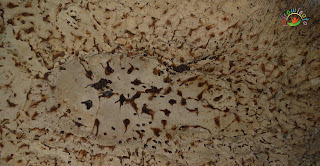 Soko Guru stalagmite stone is a stone that has the world's 4th largest size. After passing the 3 zones you will pass also called Zone bats, before it opened as a Pindul Cave Tourism Object, this room is home to thousands of small insectivorous bats, or mosquitoes. The bat hanging on the roof stopped Cave. You do not need to worry about the bats here, because it will not attack humans. Precisely bats afraid if you guide directed his flashlight towards them. The bat has its own way to decorate their dwellings by creating abstract paintings that they made with their own urine to mark territory or each. Still in this room you will see the largest curtain of stone stalactites in Pindul Cave, these stones are arranged similar to stalactites another, yet the direction of growth tends to widen to form such layers of fabric draperies were similar at your door window. After passing the rock curtain down on you will see the light which we think is very beautiful, light is sunlight that penetrates from the top of the trees on the hill and past the hole Vertical Cave. At certain hours of light will be apparent beauty. This location is a spot that we think best for you to capture the moment. A guide will take you down from the tire tubing that you sit on and let play, swim, jump and take pictures as much in this place, if you please. 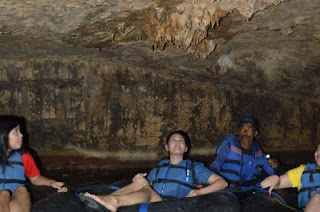 Not only that, you can also go up to the cliffs of the cave to take pictures, which perhaps you've never done before. If you do not bring a documentation tool for fear of water exposed to the risk of damaged or fall you can order services of a photographer at the counter where you buy a ticket from us. Water depth is only about half to one meter below the vertical hole. And if you want to jump while testing the adrenaline from a height of 2 meters, about 3-5 m below the water. So you do not need to worry your feet on a rock in the riverbed. Of course we forbid you remove the life jacket that you wear while in the object. Once satisfied playing at this place you will be invited by the wizard to get to the finish Pindul to swim or ride a tire tubing again. Within approximately 50 meters of vertical Goa where you play. Finish of Goa Pindul itself has Banyu Moto designation (springs). There is a dam created on the former Dutch colonial era, functioned as irrigation during irrigate an area of ​​approximately 90 hectares owned by farmers around Goa Pindul. Please ask you a more detailed guide on all things in Goa Pindul and surrounding areas. Our guides will always answer. 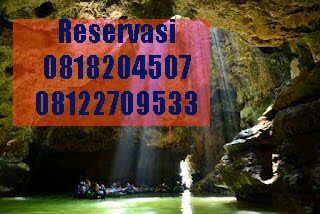 For more details you have to prove yourself in Goa Pindul Wirawisata. If you are interested to visit this place, please contact the manager via the contact person below, to obtain complete information. 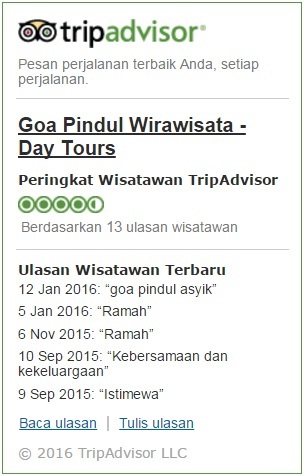 Keep in mind the above review is from our Wirawisata, because there are some operators that manage Goa Pindul. Perhaps with the delivery or a different storyline. 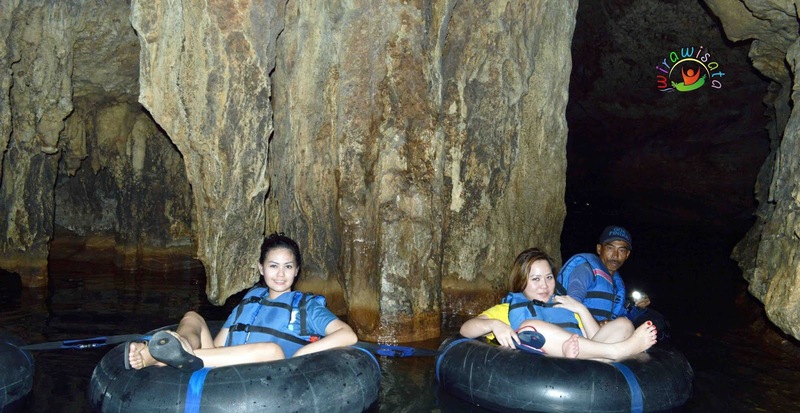 Artikel dengan kategori :goa pindul | gua pindul | pindul cave dengan judul Tourist Attraction Cave Tubing Pindul in Yogyakarta.